A unique formulation of all-natural ingredients containing garlic oil which helps to keep your greenhouse plants pest-free. Once the fuse is lit, the canister need to be left for two hours to disperse harmful insects from greenhouses. Effective against greenfly, red spider mite and whitefly. Helps plants’ natural defences. The canister is best used in the late afternoon or early evening when the weather is calm and the temperature is over 16 degrees C. Several hours before treatment water all plants so the leaves are dry at the time of treatment. Never treat plants which are dry at the roots. To start the treatment close all the windows and make the greenhouse as draft proof as possible. Place the canister on a heat-proof surface on the floor in the centre of the greenhouse and ensure your exit is not blocked. 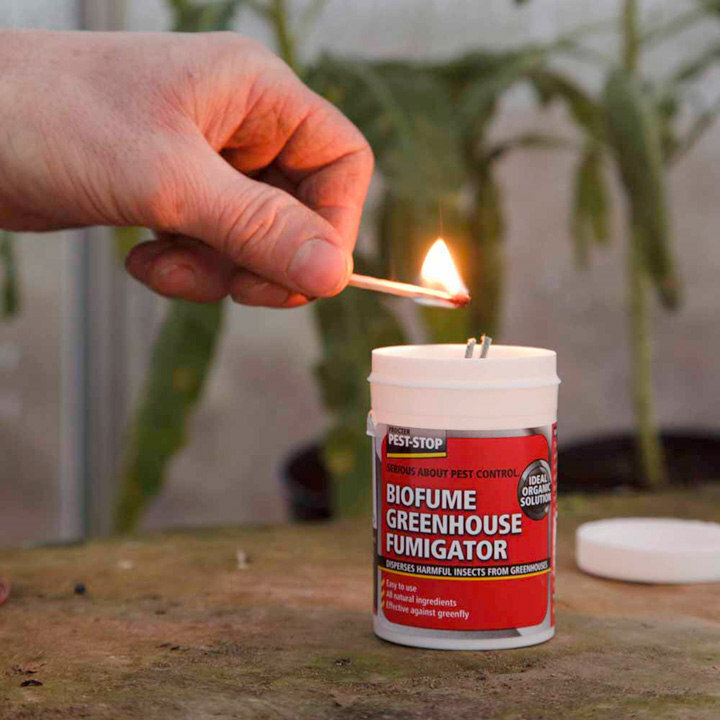 Light the fuse and immediately exit the greenhouse closing the door behind you. Leave the greenhouse closed for two hours, after which open all the windows and keep the door open for a short while. Please be advised that this product does not claim to work in the same way as the sulphur candle. It should not be used when predators are present and it makes no claim to kill overwintering spores or eggs.